We’d love your help. 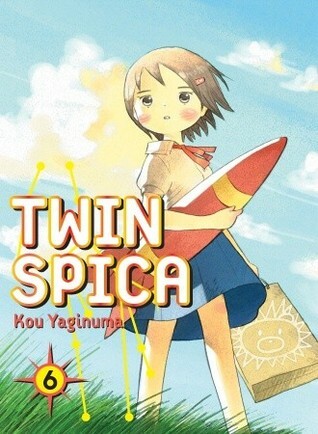 Let us know what’s wrong with this preview of Twin Spica, Volume by Kou Yaginuma. To ask other readers questions about Twin Spica, Volume, please sign up. This review has been hidden because it contains spoilers. To view it, click here. I feel like not much happened in this volume, except for a continuation of events from the last volume. Still loving this series despite that fact, but annoyed about the questions still surrounding Marika. For instance, she obviously didn't make it through survival training (although she was rescued), but none of her classmates seem to know this and she hasn't yet washed out of the program. Maybe her wealthy father is preventing that somehow? Grrrrr. Very annoyed that I have to wait a month to fi I feel like not much happened in this volume, except for a continuation of events from the last volume. Still loving this series despite that fact, but annoyed about the questions still surrounding Marika. For instance, she obviously didn't make it through survival training (although she was rescued), but none of her classmates seem to know this and she hasn't yet washed out of the program. Maybe her wealthy father is preventing that somehow? Grrrrr. Not as good as the previous volume and it felt a bit like treading water while waiting for the next adventure. As always though there was a beautiful double-page spread featuring a meteor shower and the trademark sweet nostalgia, this time in the form of origami stars. I want to know more about the orphan kids, they're so cute! The survival c Twin Spica Volume 06 by Kou Yaginuma resolves the cliff hanger of Asumi and her friends racing to the goal from their escape pods dumped into the nearby forest. It also introduces more glimpses into the history of the Lion and the mystery of Mr. Lion's on going friendship with Asumi. Took a long break from this series because my library only has the first 5 volumes and I didn't want to read the e-versions if I could avoid it. So I got this one through ILL (thanks, Denton!). Anyway, since I'd had such a long break from it I had sort of forgotten how much I like this series. It's quiet and sweet and just follows a bunch of kids training to be astronauts and the different struggles they face with family and health and history and friendship. I'm glad I kind of rediscovered it! These books capture every kind of sadness you can have, including the happy kind. This one looks at a friendship Mr Lion had when he was alive. I like the subtle exploration of really deep themes, like the guilt people carry around with them when a friend has died. This volume also gives more clues about Marika's mysterious past. As with all other volumes, the story is slow but interesting and emotionally engaging. And...once again, this series has managed to make me cry. Lots of great moments in this one: Asumi and the others going back for Marika, the origami stars, watching the meteor shower. But my favorite bit was definitely the episode about Mr. Lion and his childhood friend. This volume was once again very moving. There was even two short stories after the main comic and I was very intrigued. i feel that Asumi is growing not only in height but as a person throughout this volume.